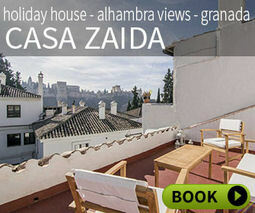 Traditional Spanish restaurant with large garden and views of the Alhambra. 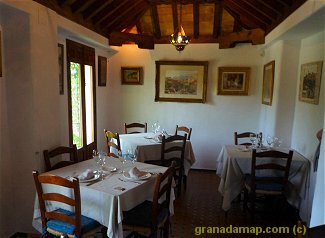 Traditional Spanish restaurant in an old house in the Albaicín with large garden and views of the Alhambra from some of the dining rooms. 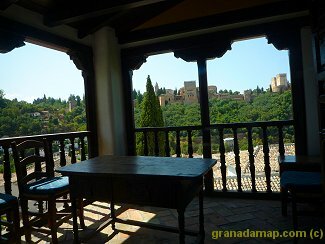 There are several rooms with rustic beamed ceilings and paintings on the walls. It is fairly expensive. 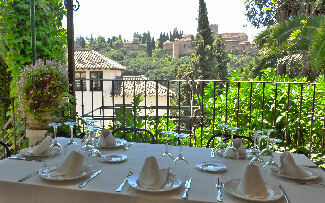 The restaurant is in the Albayzín area of Granada. The best way to get to the restaurant from Plaza Nueva is either walking or on the 31 minibus. Salman Rushdie came to this restaurant when he was writing the The Moor's Last Sigh. Very tight security was necessary because the Fatwah has only recently been issued. The photos of the visit are on the wall. This restaurant has been reviewed by 1 people. The figures on the right are the average score out of 10 based on all reviews. There are 1 reviews in English and 0 in Spanish. GREAT EXPERIENCE. I went to this restaurant last Thursday with my wife and had a very good experience.